World Of Warcraft is a MMORPG released by Blizzard Entertainment in 2004. It is the fourth game released set in the Warcraft fantasy universe. It takes places within the Warcraft world of Azeroth, approximately four years after the events at the conclusion of Blizzard’s previous Warcraft release, Warcraftt III: The Frozen Throne. Since then, six expansions to the game have been released, with the seventh expansion announced on November 3, 2017. With a peak of 12 million subscriptions in October 2010, World of Warcraft remains the world’s most-subscribed MMORPG. As with other MMORPGs, players control a character avatar within a game world in a third person view, exploring the landscape, fighting various monsters, completing quests, and interacting with non-player characters (NPCs) or other players. In keeping with the storyline of the previous Warcraft games, players must choose between the two opposing factions of the Alliance or the Horde. The players then select the character’s race out of the 11 races, followed by the class for the character out of the 12 classes. Most classes are limited to particular races. As the characters become more developed, they gain various talents and skills, requiring the palyer to further define the abilities of that charater. Characters can choose two primary professions that can focus on producing items, such tailoring blacksmithing or leatherworking, or on gathering from resouce nodes, such as skinning and mining. Characters can learn all four secondary skills: archeology, cooking, fishing and first aid, which helps to promote players to explore the massive world. Much of World of Warcraft play involves the completion of quests. These quests are usually available from NPCs, and usually reward players with some combination of experience points, intems and in-game currency. Quests allow characters to gain access to new skills and abilities, as well as the ability to explore new areas. While a character can be played on its own, players can group with others to tackle more challenging content. Most end-game challenges are designed in a way that they can only be overcome while in a group. In this way, character classes are used in speficifc roles while in a group. 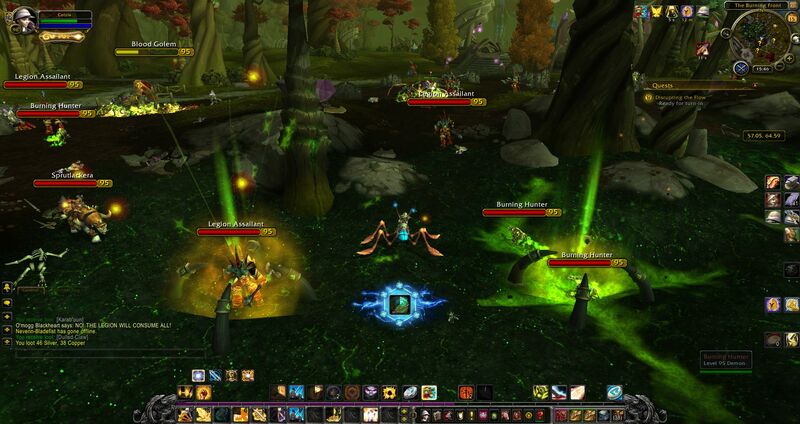 World of Warcraft also contains a variety of mechanisms for player versus player (PvP) play. Depending on the mode of the realm, PvP combat between members of opposing factions is possible at almost any time or location in the game world – the only exception being the starting zones.There are special areas of the world where free-for-all combat is permitted. Battlegrounds, for exmaple, are similar to dungeons: aonly a set number of the battleground can be made to accomodate additional players. Each battleground has a set objective, such as capturing the flag or defeating an opposing general, that must be ompleted to win the battleground. World of Warcraft is set in the same universe as the Warcraft series of real-time strategy games and has a similar art direction. World of Warcraft contains elements from fantasy, steampunk, and science fiction: such as gryphons, dragons, and elves; steam-powered automata; zombies, werewolves, and other horror monsters; as well as time travel, spaceships, and alien worlds. It is through quests that much of the game’s story is told, both trhough the quest’s text and through scripted NPC actions. World of Warcraft takes place in a 3D representation of the Warcraft universe that players can interact with through their characters. The 3D graphics in World of Warcraft use elements of the proprietary graphics engine originally used in Warcraft III, which is more than 10 years old at the time of writing this article. While updates and expansions along the years have improved the graphics uof the game, like replacing the old models with HD models, the cartoon-art style remains roughly the same. Critics described the environment as “a careful blend of cartoon, fantasy art, and realism”. The game was designed to be an open environment where players are allowed to do what they please. Players could run from one end of the continent to the other without having to pause at a “loading screen” while part of the game is retrieved from storage. The environment was described as breathtaking. Quests are optional and were esigned to help guide players, allow character development, and to spread characters across different zones to avoid what developers called player collision. The world in the game is massive and very vell designed. The game interface allows players to customize appearance and controls, and to install add-ons and other modifications. The game’s audio was well received, particularly the background music. By assigning music to different areas of the game world, reviewers felt that the fantasy style added to the player’s immersion, and that the replay value was increased. The sounds and voices used by characters and NPCs, as well as the overall sound effects, were felt to add a “personality” to the game. World of Warcraft runs natively on both Macintosh and Windows platforms. Boxed copies of the game use a hybrid CD to install the game, eliminating the need for separate Mac and Windows retail products. The game allows all users to play together, regardless of their operating system. At the start, new players usually spend a lot of time playing alone or questing in small groups of fewer than five players. Sooner or later as the players progress through the game, they will run small instances with groups of five (Dungeons). Upon reaching the maximum level, many choices are open and the world of PvP can be explored. The culmination of the PvE endgame is the 25 player raids. 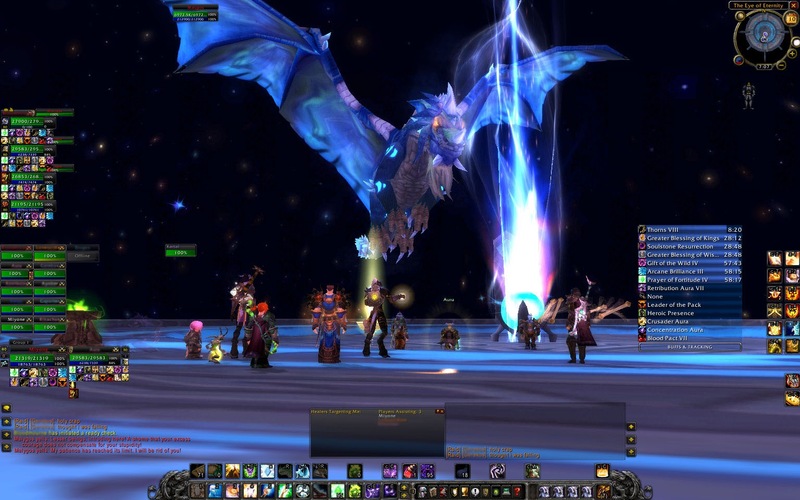 Raid groups are a way to have parties of more than 5 and up to 40 people. 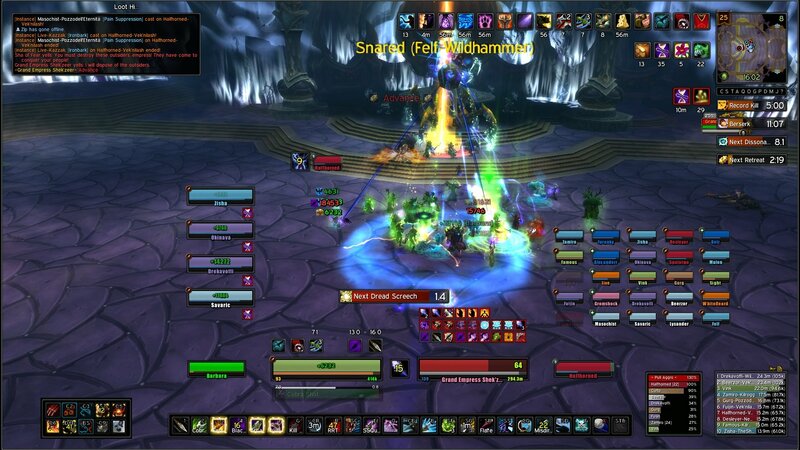 Almost all raid events and bosses require the raid members have particular levels of gear and skill, expressed as DPS, damage mitigation and healing ability. In addition, a majority of such bosses also require the group to use particular, sometimes unique tactics in order to defeat them. Also since there are so many races and classes in the World of Warcraft, every class is able to play a specific role in order to take down the bosses in a big raid. It also involves teamwork as players need to work together efficiently and it requires some amount of practice to defeat them. Raiding guilds often use additional measures to enhance their success, notably by Voice over Internet Protocol (VoIP) software, and particular add-ons that provide timing, threat and other services not available in the base World of Warcraft client. This is used in the game by rewarding the players Achievement Points when they complete different types of achievements, like completing end-game raids, slaying the rare world bosses or collecting rare items. Although the achievement points itself are not used in anyway, useful items like rare and strong gears are often rewarded as part of the journey of completing the achievement. Titles are also given to players where they can display it next to their in game name when they complete a list of specific achievements, like Arena Master is given to a player when he completes a list of 8 achievements in the Arena (a 2v2 PvP battle). This allows players to distinguish themselves from the norm and feel sense of achievement, which will in turn keep the players coming back to play.